When Paul Ainsworth opened No 6 in 2006, Padstow's key food attraction was Rick Stein's flagship seafood restaurant. Stein is still the doyen of Padstow, but in his wake Paul Ainsworth has built his own successful restaurant business. No 6 is still going strong, having held a Michelin star now for almost five years running, and recently it underwent an extensive refurbishment, including the launch of the CiCi cocktail bar on the first floor above the restaurant. The kitchen team is still lead by Paul Ainsworth and head chef John Walton, who has been with him since the early years of the restaurant. 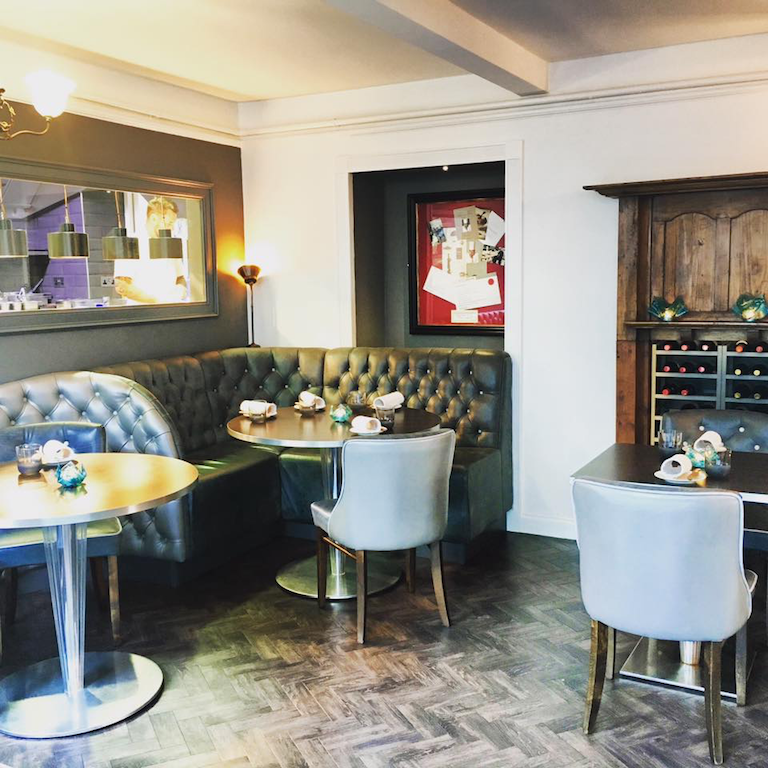 Ainsworth's second restaurant Rojano's in the Square (Italian cuisine) is a popular hang-out for locals and tourists, and new to the Ainsworth family (since December 2015) is Padstow Townhouse, a luxury boutique hotel with six individually designed suites, located in Padstow's old town. Winning the finals of Great British Menu in 2011 with his dessert course "A Taste of the Fairground" instantly brought Paul Ainsworth national prominence. He's been a regular face on the BBC since, including Saturday Kitchen, Yes Chef, and in this year's Masterchef series, when his appearance almost broke twitter. 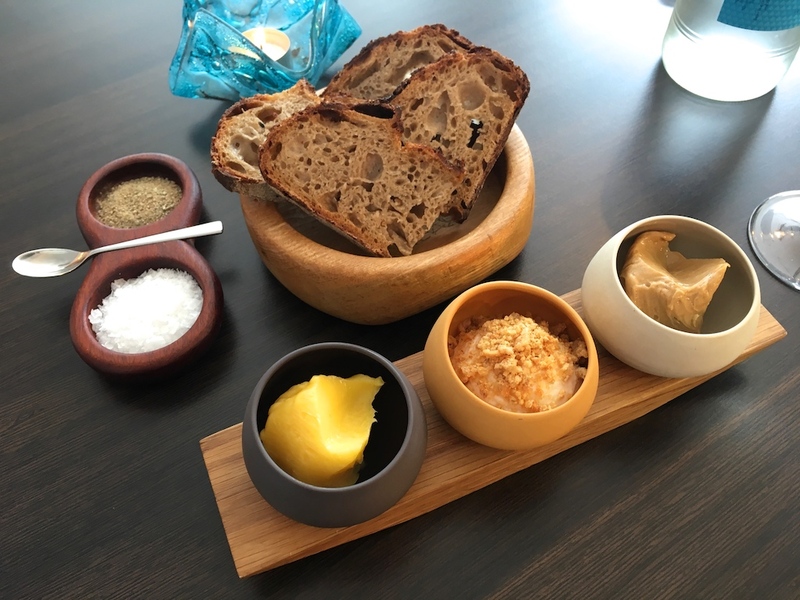 First to arrive was some delicious bread served with two types of Jersey milk butter, one plain and one caramelised, and some gorgeous whipped smoked cod's roe garnished with pork crackling. 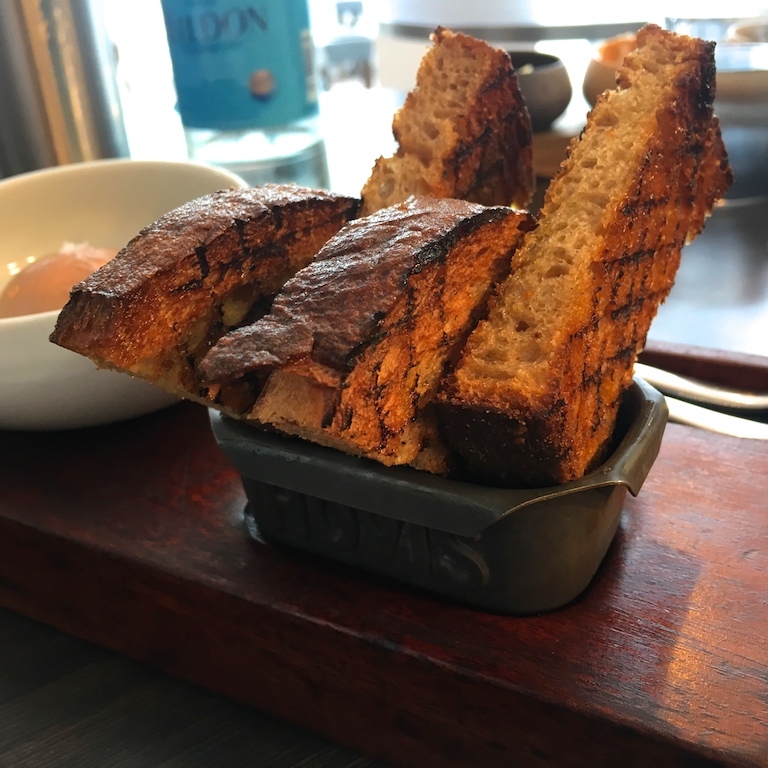 This was followed by (to share) bird's liver paté with piccalilli and grilled sourdough toast, one of the restaurant's classics. 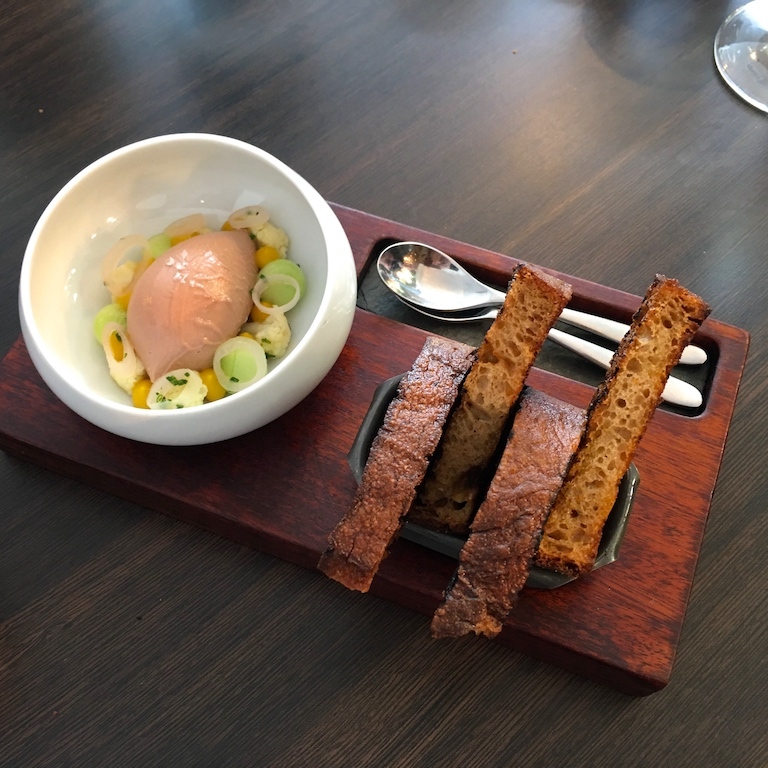 A perfectly smooth paté with good liver notes and its richness was counterbalanced nicely by the elegantly sharp, deconstructed piccalilli, including dots of piccalilli puree, crunchy pieces of cauliflower, shallot rings and little pickled cucumber balls. I enjoyed this dish for the first time in 2011, and although it was already delightful at the time, I found this version more polished and refined. 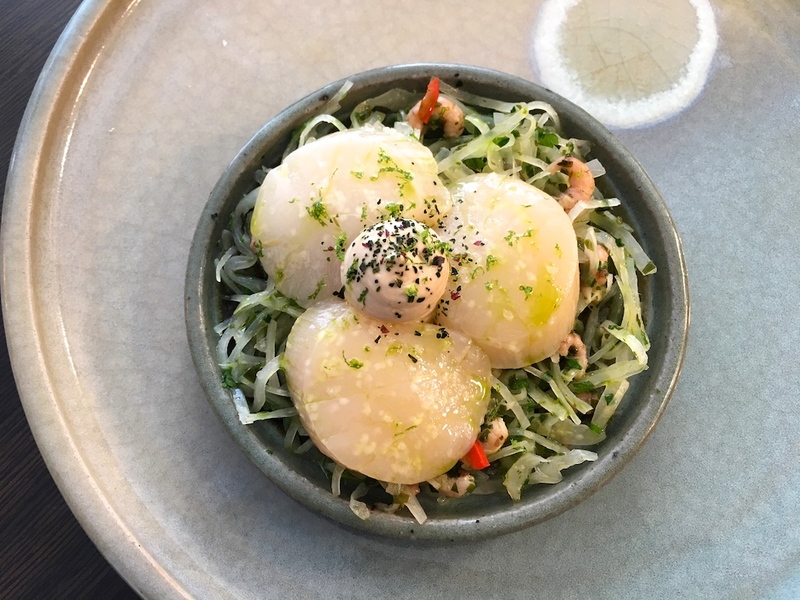 Second course were raw scallops, simply seasoned with some fresh lime zest and a drop of olive oil, and served on top of a crunchy, kimchi-style "salad" with brown shrimps. Nestled between the scallops was a dollop of Gentleman's relish crème/mayo. The kimchi salad was (intentionally) light in style and didn't just offer crunch, but also gave the dish a nice contemporary touch and intensified the sweetness of the scallops and the brown shrimps. A well-constructed, textural dish that was full of flavour and character, and the Gentlemen's relish mayo added an extra salty/fermented element tot the dish. This dish was paired with a glass of sparkling sake, which gave it a nice sweet finish. 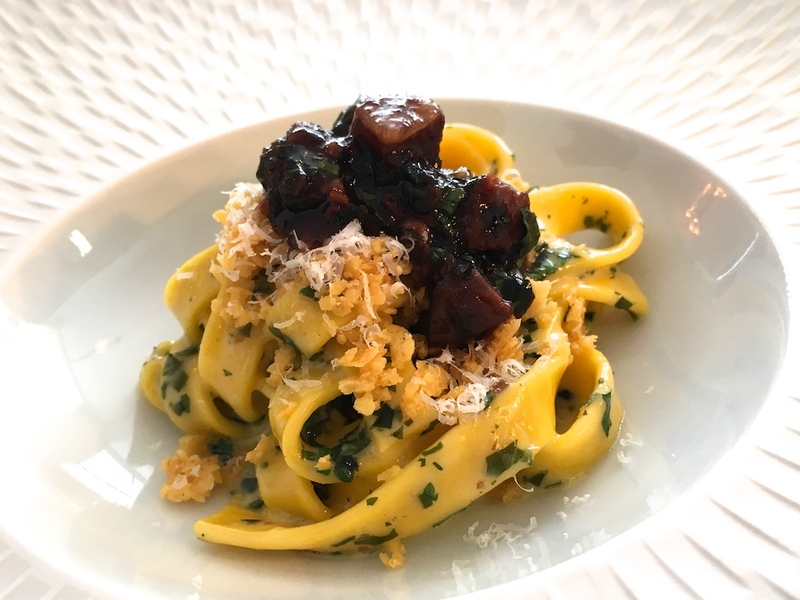 Third course was an indulgent pairing of homemade egg pasta with freshly grated and crisp Parmesan cheese, and a deeply flavoured "Bolognese" ragu, made with Jacob's ladder (short rib), chicken liver, pancetta, and bolstered with aged beef fat, the latter adding depth of flavour and complexity. The ragu was finished with a seasoning of three types of dried seaweed and fresh tomato concassé, which offered a certain lightness and prevented the ragu from being to heavy. 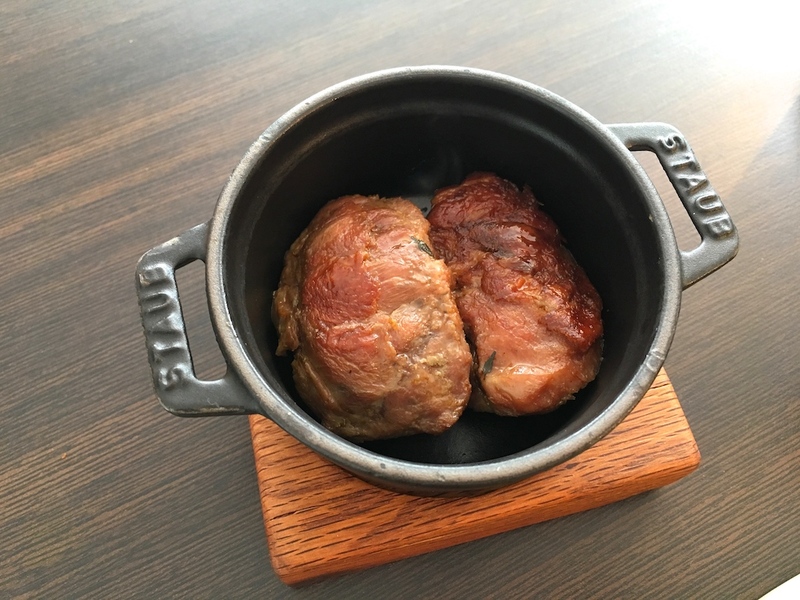 My main course was a feast of three different preparations of pork (Saddleback) served in a pretty little cast-iron Staub sauce pan. 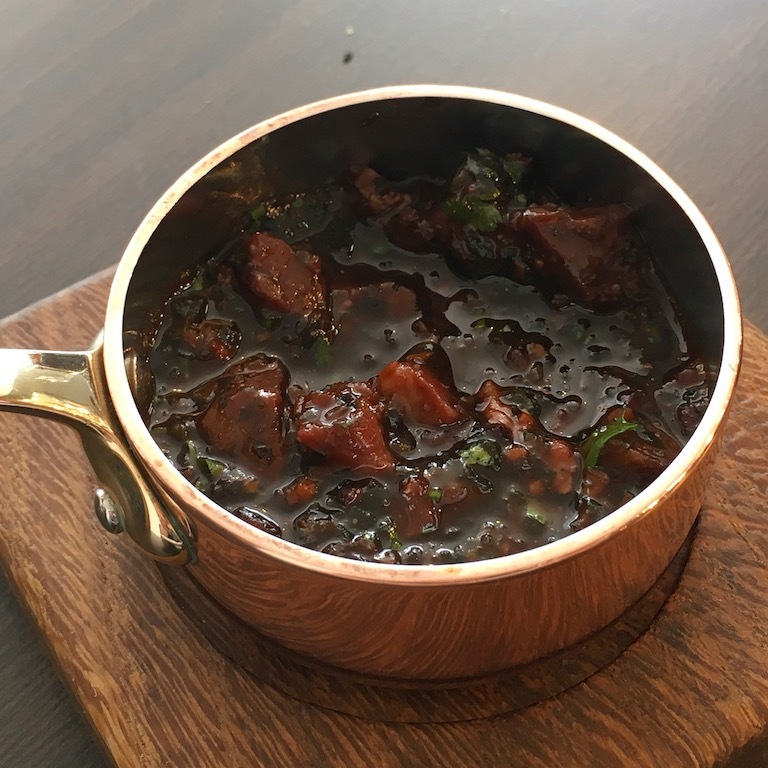 At the bottom of the pan were two pieces of pork cheek (aka chaps), nicely coloured on the outside and with beautiful soft fork-tender meat. 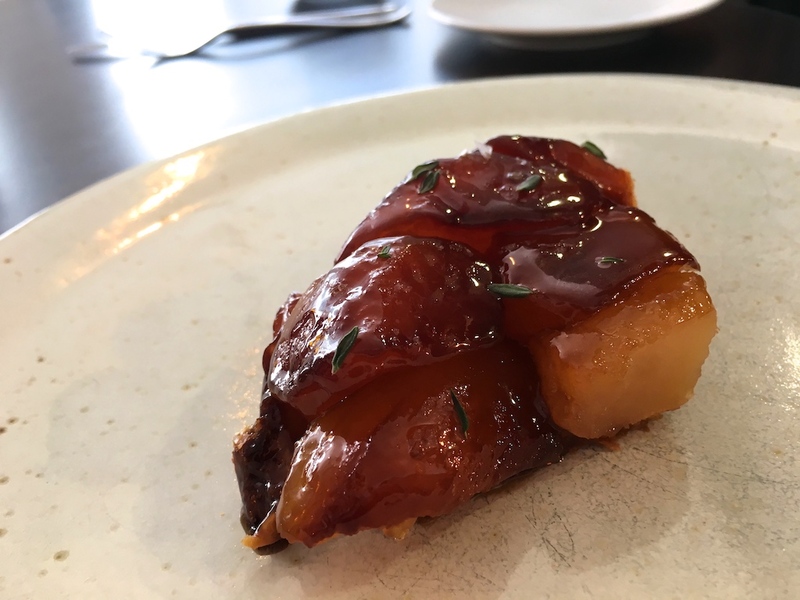 Then there was a slice of rolled, pork belly, skillfully cooked to succulent perfection, but perhaps best of all was a piece of exquisite pork crackling decorated with dots of apple jelly and fresh thyme leaves. 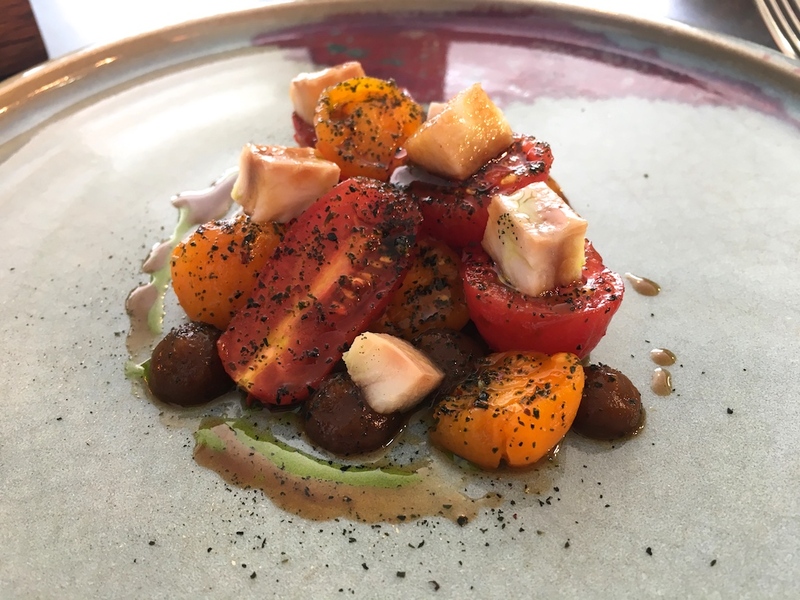 Served on the side for balance was a little dish of sweet pickled cherry tomatoes, seasoned with dried seaweed, dots of roasted onion puree, and a delightful garnish of pieces of smoked eel. Altogether a hearty combination of flavours and textures, with a great balance between richness and intensity, and the side dish delivered a delicious additional umami sweetness. The cheese course at No 6 is a very special affair based on the classic cheese, fruit and biscuit combination. 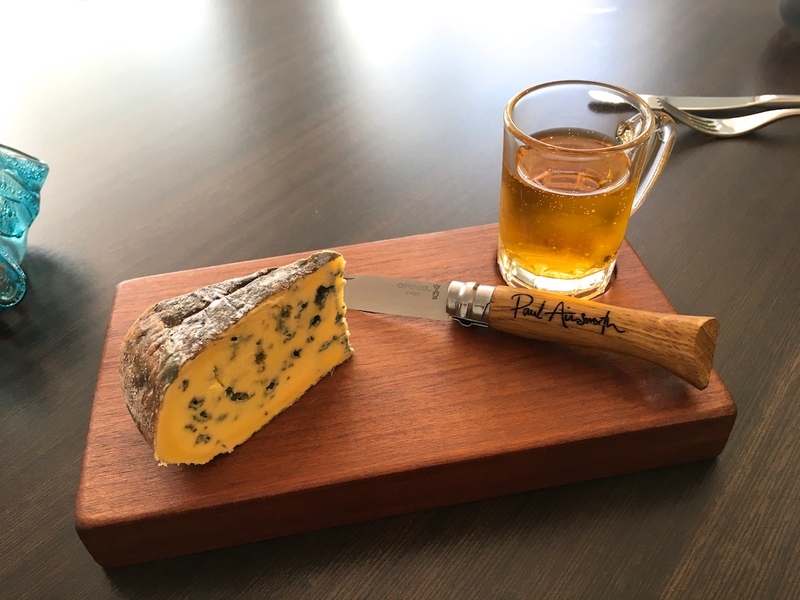 The cheese is a wedge of Barkham Blue, an award-winning cheese from the Two Hoots cheese dairy in Barkham, made from Guernsey cows's milk, and accompanied here by a little mug of cider, and a piece of beautifully caramelised apple pie. A match made in blue cheese, apple tart, and cider heaven. Dessert was a very refined take on bread & butter pudding, the bread pudding cut up in little cubes, served in a creamy vanilla sauce with rum-soaked raisins, and covered with a fantastic chocolate ginger snap disc. Perched on top was some vanilla ice cream with a little well of caramelly Pedro Ximénez sherry. This dessert was paired with an accompanying glass of 2013 Sharp's Brewery 6 Vintage Blend No. 9 beer. 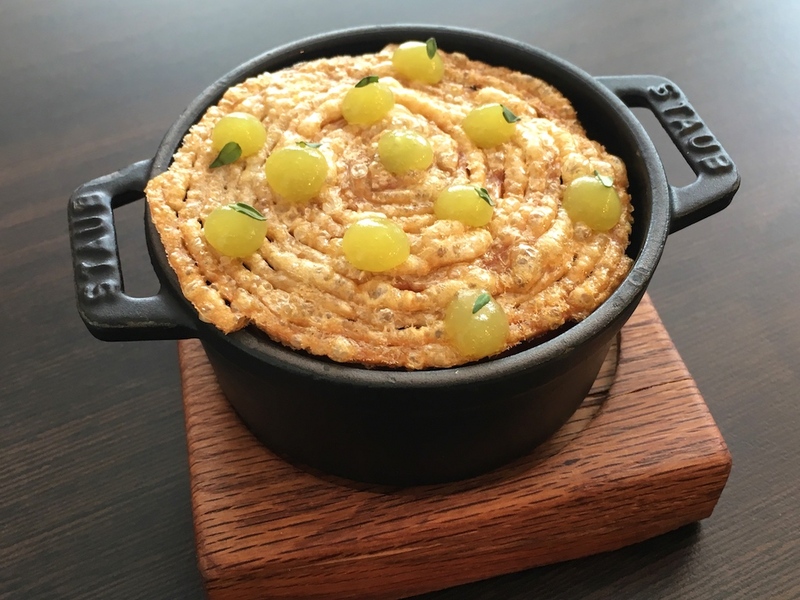 Training with chefs like Gordon Ramsay, Marcus Wareing and Gary Rhodes, gives a chef a great career start, but it is Paul Ainsworth's own talent and personality that have taken him where his today. My first three meals at No 6 were over a period of 3 years from 2011 to 2013. 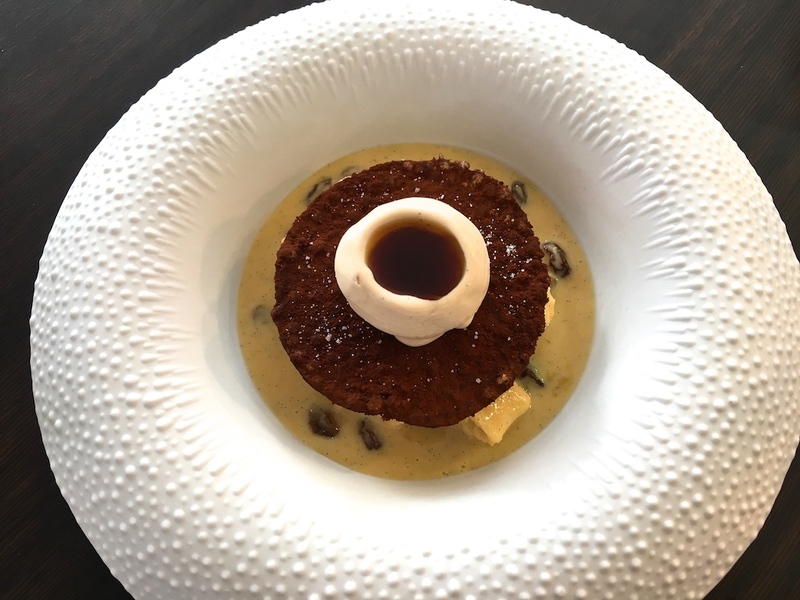 These were consistent meals with very attentive service and accomplished cooking, but in comparison today's dishes displayed a higher level of finesse and more attention to detail, both in flavour and in presentation. The cooking at No 6 is decidedly classically based, but the scallop and kimchi dish also shows there's room for more contemporary ingredients/techniques, but sensibly used, no experimental stuff. The ingredients are still excellent and thank goodness that Paul Ainsworth has resolutely stuck to his a-la-carte guns. 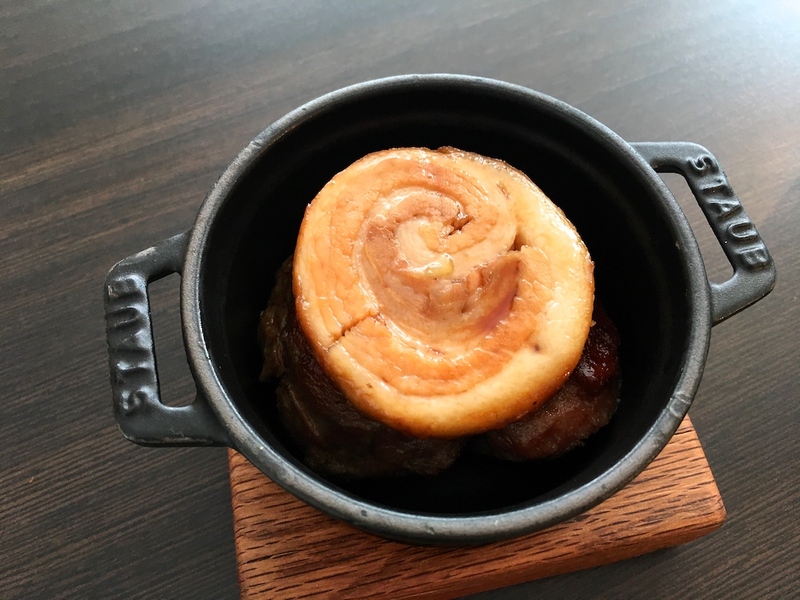 What better example is there of a magnificent a la carte dish than the pork; the wonderfulness of this dish would probably be lost in a (smaller) tasting menu version. Fantastic food at fair prices, served in welcoming and relaxed surroundings, No 6 does everything right for me.